Saint Michael is the "Prince of the Heavenly Host," the leader of all the angels. His name is Hebrew for "Who is like God?" and was the battle cry of the good angels against Lucifer and his followers when they rebelled against God. He is mentioned four times in the Bible, in Daniel 10 and 12, in the letter of Jude, and in Revelation. Michael, whose forces cast down Lucifer and the evil spirits into Hell, is invoked for protection against Satan and all evil. Pope Leo XIII, in 1899, having had a prophetic vision of the evil that would be inflicted upon the Church and the world in the 20th century, instituted a prayer asking for Saint Michael's protection to be said at the end of every Mass. Christian tradition recognizes four offices of Saint Michael: (i) to fight against Satan (ii) to rescue the souls of the faithful from the power of the enemy, especially at the hour of death. (iii) to be the champion of God's people, (iv) to call away from earth and bring men's souls to judgment. 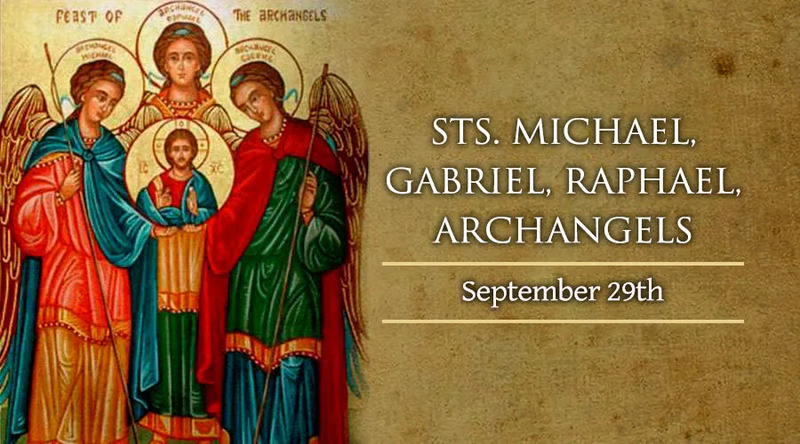 Saint Gabriel, whose name means "God's strength," is mentioned four times in the Bible. Most significant are Gabriel's two mentions in the New Testament: to announce the birth of John the Baptist to his father Zacharias, and the at Incarnation of the Word in the womb of Mary. Christian tradition suggests that it is he who appeared to St. Joseph and to the shepherds, and also that it was he who "strengthened" Jesus during his agony in the garden of Gethsemane. Saint Raphael, whose name means "God has healed" because of his healing of Tobias' blindness in the Book of Tobit. Tobit is the only book in which he is mentioned. His office is generally accepted by tradition to be that of healing and acts of mercy. Raphael is also identified with the angel in John 5:1-4 who descended upon the pond and bestowed healing powers upon it so that the first to enter it after it moved would be healed of whatever infirmity he was suffering.